Jimmie Johnson who drives the Lowe's #48 Chevy in the NASCAR Nextel Cup Series, will sign Racing Champions diecast and hats at the RC2/Press Pass booth at The National Sports Collectors Convention in Cleveland. On Thursday, July 22nd from 1:00p-3:00p, NASCAR's current points leader will sign Racing Champions diecast and hats for collectors who purchase these items at the RC2/Press Pass booth. The diecast and hats will be sold at normal suggested retail prices with no additional charge for the signature. "Press Pass is excited about having Jimmie at the National," said Miles Atkins, Senior Marketing Manager for Press Pass, a division of RC2 (NASDAQ: RCRC). "Through our NASCAR trading card products, we strive to bring fans and collectors closer to their favorite athletes via race-used memorabilia cards and autographs. 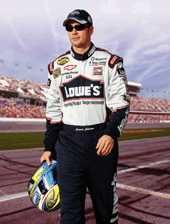 Jimmie's appearance is a natural extension of that objective." The 25th National Sports Collectors Convention runs from Thursday, July 22nd through Sunday, July 25th at the International Exposition Center in Cleveland, Ohio.